Tadanori Yokoo’s seminal and unpredictable career began in the 1960s, when Japanese designers were adopting the tenets of Western Modernism. Breaking standard conventions by depicting the darker aspects of human life, such as death and erotica, Yokoo embraced vivid colors and combined them with complex compositions and deliberately old-fashioned typefaces. And like his California counterparts, Yokoo used the visual vocabulary of psychedelia to express a fascination with altered states of mind and his own consciousness. An active participant in the underground art movements in 1960s Japan, Yokoo’s provocative designs emphasize his own existential contemplations. In 1974, Yokoo took a trip to India and immersed himself in the spirituality of Hinduism and related symbolism. An extended hospitalization following a car accident in 1970 and his spiritual endeavors led to dreams of UFOs and apocalyptic utopias. Yokoo’s 1974 poster, “Takeda Cosmetics for Men” in the Drawing, Prints and Graphic Design’s collection, demonstrates the designer’s idiosyncratic, evocative aesthetic. The poster’s central, circular image of several odalisques is taken from a well-known 1862 painting by Jean-Auguste-Dominique Ingres, “The Turkish Bath.” Yokoo places the women in a new setting: an ocean-side landscape of picturesque cliffs. 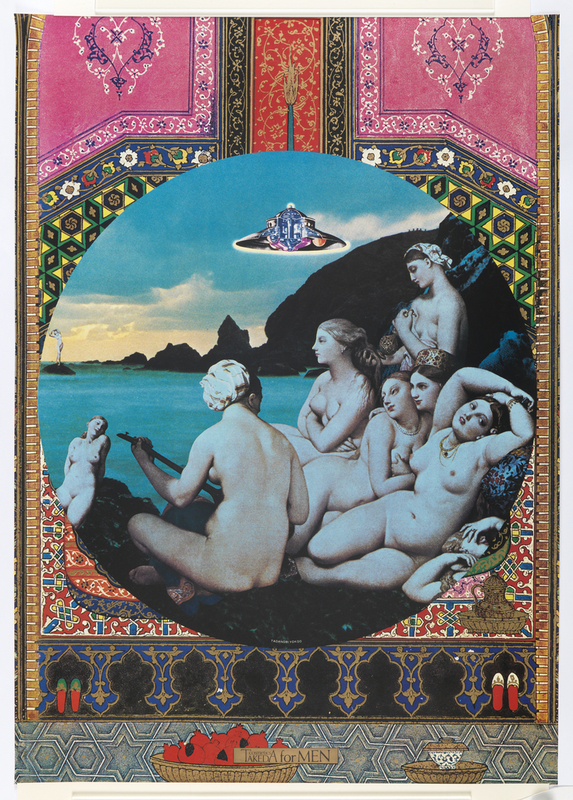 A purple, blue and black UFO hovers above, informing the viewer of Yokoo’s surreal environment. The central image is superimposed on graphic arabesque designs in bright pinks, reds, yellows, oranges and blues. The client, Takeda Chemical Industry, is a large pharmaceutical company in Japan and this advertisement aims to appeal specifically to men. However, the only visual cue to the product is the small label at the bottom “Cosmetics/Takeda for Men.” Instead, the advertisement converts to a seductive invitation; male viewers peer through the circular image, a window to the sensual and exotic world that Yokoo creates. The audience becomes voyeurs to a utopian landscape and momentarily leaves behind the pragmatism of everyday life. Lily Gildor is a candidate in the MA History of Design and Curatorial Studies program at Parsons The New School of Design and the Cooper Hewitt, Smithsonian Design Museum. She is a Master’s fellow in the Drawings, Prints and Graphic Design department. Yoshiaki Tōno, “TADANORI YOKOO: BETWEEN PAINTING AND GRAPHIC ART,” Artforum, September 1983.